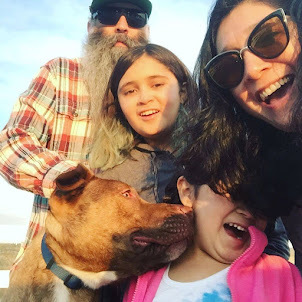 Punk Rock Parents: Homeschool Week 19: I Repeat the Tornado Is Touching Ground! Homeschool Week 19: I Repeat the Tornado Is Touching Ground! 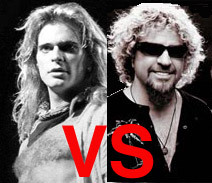 Language Arts- This week was about the letter V and was a great way to introduce Louie to Van Halen. We taught her that David Lee Roth over Sammy Hagar all the time, every time. We also listened Veruca Salt (we always try to show her some girl rockers!) and to one of Poppa's favorite bands, The Vandals. Seeing The Vandals play Warped Tour was the only time I saw Popps actually sing along to a band. That is huge! We also did a bunch of worksheets on the letter V but really the important lesson here was the music. Reading: We worked more on our short vowel sounds. She is reading and blending pretty well. We played a few games, did some worksheets and read books. Louie's teacher had some great fun activities this week. We also read the story "The Mitten" by Jan Brett. A cute story about a lost mitten and the creatures that find some warmth in it. We looked at sequence of events and did a few worksheets looking at the author and setting. Writing- We worked on labeling a picture and going back and adding steps when it comes to writing out how-to sentences. This was a fun week. Louie drew a picture of our house and labeled the windows, door and roof. We need to work on using lower and upper letters correctly. Math- We are doing addition now. We talked about the plus sign and the equal sign. 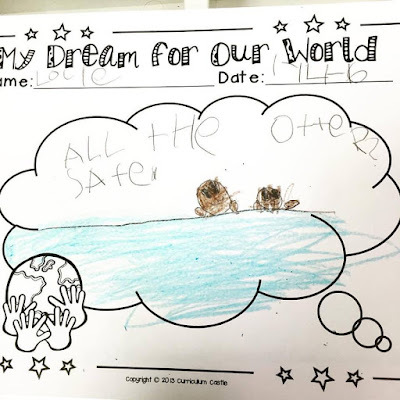 Louie did really great with all the worksheets. We ended the week with a great dice game. She rolled the dice and wrote each number down and then she had to add each couple of numbers. Social Studies- Because of the holiday we studied Martin Luther King this week. It was a bit of a challenge for me to talk about MLK in terms Louie would understand. We talked a lot about making the world a better place. 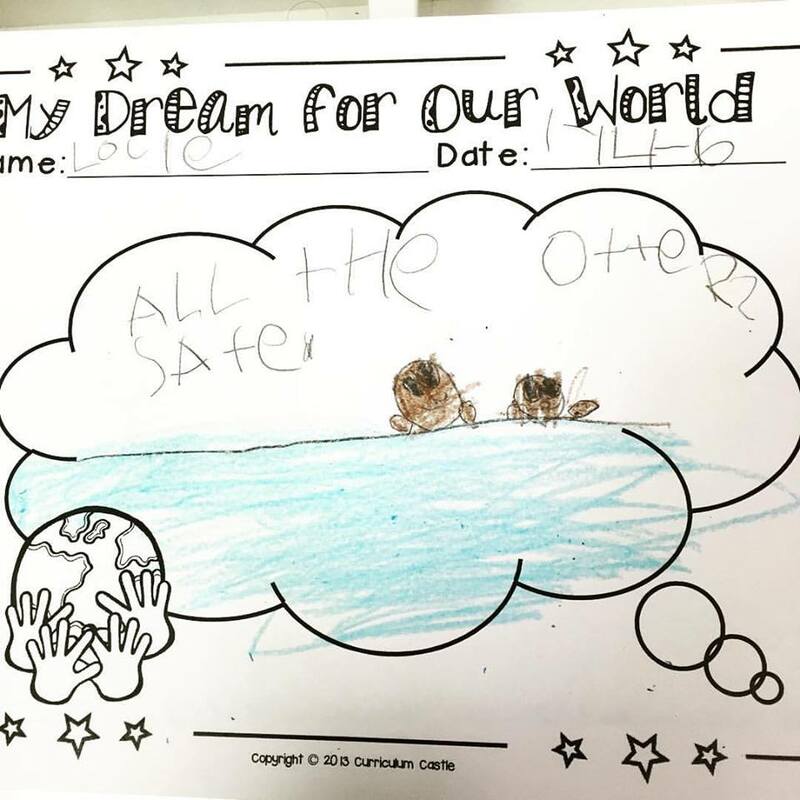 Of course Louie's dream for the world involved sea otters. Science- We jumped into the states of matter. We looked at how matter is made of particles and how the particles interact will determine is something is a solid, liquid or a gas. We did a sorting activity and Poppa and Louie made goop to look how it can act like a solid and a liquid. Language Arts- Phi read chapters 17-20 of The Westing Game. The story is getting interesting. The connections between the 16 players and Mr. Westing are starting to reveal themselves and we are getting closer to finding out who the "murderer" is. We did the usual worksheets and this week Phi finished her Sunset Tower project. She used a poster board and made a 5 story building. 4 windows in the first 4 stories and 2 windows and a door on the bottom floor. In the 16 windows she drew each character and wrote 3 physical descriptions and 3 personality traits and 1 quote from the book to support them. The last 3 on the first floor she drew different scenes from the book with descriptions. And of course I forgot to get a picture of it. Math- Oh math. This week we had to call my super smart sister to help out with one problem and we had a lot of issues when it came to pretty basic math. I am talking multiplying double digits and even subtracting numbers with borrowing. I have no idea what is going on but there are times when simple math is a struggle, like it is something she has never done before. After practicing a few times she would get the concept but her retention is just really weak. This goes for all subjects. Social Studies- More explorers. This week we looked at Jacques Cartier and his travels into Canada. We looked at his voyages from France. We also looked at the different reasons why countries sent explorers to North and South America. She then had to pick one reason and write a postcard back home explaining the reason for the voyage. She choose to be an explorer from Spain heading to North America to develop a colony so that Spain could become more powerful. A full and fun week! Wow, you have covered so much in just homeschooling, my kids who go to preschool have not done that much. The video is so cute and your girls are beautiful. May they always succeed in life.